Defense wins championships – or does it? Offense wins games. Defense wins championships. I’ve heard that quote in relation to lacrosse, football, and basketball, and it’s probably been applied in other sports as well. I know that a lot of Toronto Rock fans from the early 2000’s believed it, but is it generally true? Let’s take a look at the NLL Champions from 1987 to 2011, covering 25 seasons. Don’t worry, this isn’t nearly the propeller-head stats-fest that my article on back-to-back games was. I went through each Championship team and calculated their rank in the league that year in terms of both goals scored and goals against. Just so we’re clear, “first” in goals scored is the highest amount, while “first” in goals against is the lowest. That’s fairly basic and obvious stuff, but I wanted to spell it out to avoid any misunderstandings. I’m going to ignore the absolute value of goals for and against, mainly because a different number of games were played in different seasons. Using the rank rather than the value factors that out, as well as other differences like rule changes. I’ll look at goal scoring trends in the NLL in a future article. The “rank” I’m using for a given team is “1 plus the number of teams that are ahead of the team in question”. So if two teams scored more goals than the team I’m looking at, they are ranked third. If another team scored the same number of goals, then the team I’m looking at was actually tied for third, but I’m ignoring that – tied or not, they still had the third-highest total. Before we get to the general trends, here are the extremes. In the 25 years of the NLL, only once has the Championship winner been both #1 in goals scored and #1 in goals against – the 1994 Philadelphia Wings. At the other end of the spectrum, the 2003 Rock were ninth in goals scored (they scored 36 fewer goals than the #1 Bandits that year), but first in goals against. The 2007 Knighthawks were the exact opposite – first in goals scored (scoring 30 more goals than anyone else) but ninth in goals against. If defense wins championships, then it stands to reason that most Championship teams would rank higher in goals against than they would in goals scored. But we don’t find that to be the case. Out of 25 seasons, 12 of the Champions (or 48%) ranked first in the league in goals scored, but only 8 (32%) ranked first in goals against. The average rank for goals scored is 2.6 while the average rank for goals against is 3.1. This means that on average, the Championship team is closer to the top of the league in goals scored than they are in goals against, i.e. most Championship teams are better offensively than they are defensively. Defense does not win championships. But there was a period where it did. From 1998 to 2003, the Rock won four titles and the Wings won two. Only one of those teams – the 2001 Wings – was not first in the league in goals against, and only those same Wings were as high as third in goals scored. The Rock Championship teams in 1999-2000 and 2002-2003 were 5th, 6th, 7th, and 9th respectively in goals scored. But before that period, the top defensive team had only won the Championship once, the 1994 Wings, and it’s only happened once since, the 2009 Roughnecks. On the other hand, from 1988 to 1996, every Champion except one (the 1990 Wings) was first in goals scored. It didn’t happen again until the 2005 Rock, but then it happened in five of the next seven years. 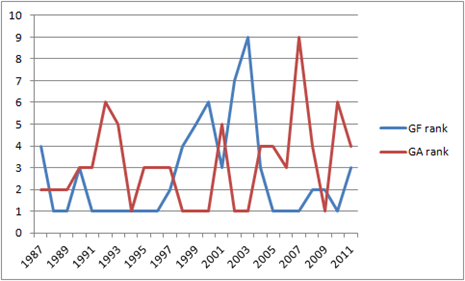 Here’s a graph of the ranks of the Championship teams in both goals scored (blue) and goals against (red). Notice how the blue line stays low until about 1997, then jumps up for a few years before dropping back down again. At the same time, the red line is higher during the 90’s, then drops down to the bottom while the blue line is high, then grows again when the blue one drops. That inversion was the Les Bartley era in Toronto. Generally, the NLL Champions have been better offensively than defensively. But as we’ve seen, from about 1998 to 2003, that trend was reversed. Of those six seasons, the Toronto Rock under Les Bartley won four Championships – and lost a fifth to the Wings in a low-scoring defensive game. This is one reason Bartley was so well-respected – not only because he led the Bandits to the only undefeated season in NLL history, but because he bucked the trend and built a team that was a defensive powerhouse rather than offensive, and was exceptionally successful doing it. This is not to say that you don’t need a good defense to win, of course you do. And it’s not to say that you can’t win with a great defense and adequate offense. It’s just happened far more often in the past the other way around. This entry was posted in Buffalo Bandits, Philadelphia Wings, Rochester Knighthawks, Stats, Toronto Rock. Bookmark the permalink.